Documenting the rich diversity of the lives of African Americans is the mission of a national group called The Historymakers. 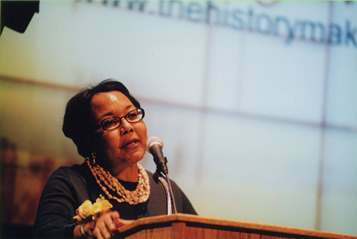 Julianna Richardson is the founder and executive director of The Historymakers. Richardson and her videographers are in Alaska this week for the first time to capture the stories of 11 Alaskans. The video interviews here along with thousands of others are being archived at the Library of Congress and shared with more than 40 universities and public libraries. Richardson says she grew up not knowing her own history or the contributions of other African Americans to the United States, so even though her professional background is in law, The Historymakers became her life’s work. Richardson spoke with Alaska Public Media’s Lori Townsend about the group. RICHARDSON: People don’t know about the African American experience. A lot of people think our project is about civil rights because it’s as if that’s the only thing they know about the Black experience. When I was saying that I was coming here to Alaska, people were like, “Are you kidding? There can’t be any Black people in Alaska. Black people don’t like cold weather.” (laughs) But, I have wanted to come here since the early days of my project. Each community has it’s own personality and there’s a lot of independent spirit here. TOWNSEND: What did you hear from Alaskans that really stand out to you. Have you really had a chance to view the content enough yet. RICHARDSON: Yes. What I want to say is that, Alaska for most of the people we interviews — I would say all of them, I wouldn’t say most — represented a chance to get away from a constrictive environment. To have opportunities that did not exist in their home states, and in many ways, a fresh start. And not to be sort of held back, not that… they’re not showing it as a fantasy, you know, that it was without racism. But, that’s what sort of resonates. TOWNSEND: Do you see this as kind of resetting the whole idea of who Black Americans are? And instead of just this focus on the tragic past, that this can more normalize that people are doing every kind of profession and every kind of accomplishment that every other American is doing? Is that part of what’s at play here? RICHARDSON: I won’t say that was my intent, but that’s essentially what it will do. I mean, the problem about slavery in the American tradition is that no one either wanted to be a slave, or wants to have that slave background, or no one wanted to be responsible for it. So what has essentially happened is that we’ve worked in unintended complicity to cover up this wonderfully rich history that has a lot of context to it. And I don’t want any other child to feel the way I felt, in a classroom where I was the only Black student. And the teacher was asking me about our family, you know, our backgrounds. And everyone knew their’s and I didn’t know mine. So that’s what I think, in the larger context, what we hav. TOWNSEND: Julianna, as you well know, there’s a lot of racial tension in our country right now. Do you see a role for the HistoryMakers project in, sort of, alleviating some of that tension through education and sharing our collective experience as Americans? Do you think this effort to elevate these stories and accomplishments of African American citizens here can help somehow in this effort going forward? RICHARDSON: Yes I do believe that. And I often sometimes refer to myself as sort of an activist historian, even though I’m a lawyer by training. I was born in 1954, which is the year of Brown v. Board of Education, which is often touted as a watershed moment. It was a watershed moment, but when you look back, now you wonder. and even now as you say in the current climate we’re in, I don’t think most of the people that we interview who grew up in a different point in time, and went through the Civil Rights Movement… I don’t think they could envision the climate we’re in, that it was possible to exist. And that we’re back, in many ways, in the same place. And divisions, like crazy horrible divisions. This is the question. What we’re really hearing being debated in society is who has value. Who has value to society? And the people who have value should stay and the people who don’t have value should leave. And so I think really that the fact that we have content that shows the complexity, there are just all these things that people don’t associate with the Black experience. And so, I feel very, very positive. Cal Williams, Former President, NAACP Anchorage. A reception at 6 p.m. this evening in Anchorage will honor the 11 Alaskans whose stories will now be part of the national Historymaker’s project.